Arnold Palmer Golf Apparel seeks to bridge the swagger and style of Arnold Palmer with today’s golf fashion by blending technical performance attributes with on-trend golf styling. The Arnold Palmer Golf Apparel line is comprised of traditional golf silhouettes with a relaxed fit and modern design features for apparel that looks great on and off the course. 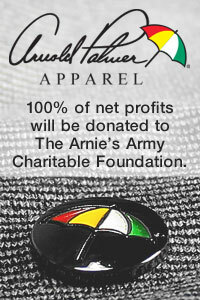 The Arnie’s Army Charitable Foundation (AACF) and the new Arnold Palmer Golf Apparel Company have formed a unique association and business model whereby, 100% of net profit will be donated to AACF to further the philanthropic efforts of Mr. Palmer and his Family. The generous charitable legacy started by Mr. Palmer will be further enhanced by retailers and consumers alike buying Arnold Palmer golf apparel by being a part of “giving back” to those in need.